They’re gone, but not forgotten. Our second category of the 2013 Swamplot Awards for Houston Real Estate aims to determine what was, exactly, this year’s Best Demolition? Thanks to your help, we’ve compiled a list of potential candidates. With some more help — in the form of your votes — we can pick the winner. Before you vote, ask yourself this: Should this category commemorate the best act of demolition, the removal that produced the best results, or the best building that happened to be torn down? The voting rules for this year’s Swampies are posted here, but they’re not that complicated: You can vote in this category through each of 4 methods: in a comment below, in an email to Swamplot, on Twitter, or on Swamplot’s Facebook page. If you’ve got a favorite candidate, start a campaign! And don’t forget to add why you’re voting for that particular nominee. The polls close for all categories at 5 pm on December 27th. Without further, um . . . adieu, let’s knock out the nominees for Best Demolition of 2013, shall we? 1. Kelly Village Apartments, 1119 Grove St., Fifth Ward. It took a Komatsu to finish the job that Hurricane Ike started. On June 4, the city ceremoniously demolished 63 damaged units of the Houston Housing Authority’s 333-unit Kelly Village Apartments. The structures had been vacated — but were not exactly empty. One mother wrote a letter to the Housing Authority requesting that something be done “as drug dealers and thugs made themselves at home in [the] vacant buildings.” In place of the cleared apartments adjacent to I-10, the city is building a 3-acre park. 2. Reliant Astrodome ramp towers, ticket booths, berms, and accoutrements, Reliant Park. What a long, strange story it’s been. The big kaboom was heard last weekend, but work had begun months earlier. 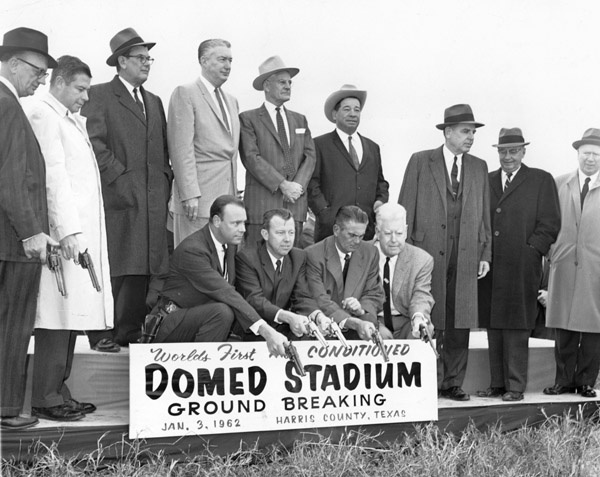 County commissioners approved the demolition of the helical ramps surrounding the Astrodome — along with berms, ticket booths, electrical equipment, and exterior ramps — back in August, when it looked like the Harris County Sports and Convention Corp.’s plan to turn the long-vacant structure into a single-story exhibition space called the New Dome Experience might meet with voter approval. And demo work, which county judge Ed Emmett labeled “improvements” to the structure, began before voters even had a chance to vote on the bond proposal that would have funded the building’s renovation. A few days before election day, Reliant Park held a sale and auction of the Harris County Domed Stadium’s interior furniture, selling off seats, turnstiles, signs, and dugout benches. Next up: carving out the asbestos. If the county does end up with a plan to reuse the structure in some way, there’ll be less of it they’ll need to renovate. 3. Baptist Temple Church buildings, Rutland and 20th streets, Houston Heights. To raise money for repairs in 2008, the Heights’ Baptist Temple Church sold some of its property to Walgreens, which set up shop next door. This year, to fund additional work, it stuck to the same formula. In May, the Heights church was able to sell 2 of its oldest buildings — its original sanctuary, built in 1912, and a larger sanctuary built during the 1940s — to developer Braun Enterprises, who promptly demolished them to make way for a new retail center. By sacrificing its older unused buildings, the Baptist Temple Church was able to fund a $3 million renovation of its remaining 65,000-sq.-ft. T.C. Jester Building on 20th, adding a new 300-seat sanctuary and updating classrooms and offices. 4. Randalls Flagship #1013, 1407 S. Voss Rd., Memorial. How neatly this once-happenin’ grocery store stepped aside: When news came that a Trader Joe’s was headed to Voss and San Felipe, it didn’t take very long before more news came — that the Randall’s located right across the street was closing. And then the building was demolished — to make way for a new Whole Foods Market. 5. Fiesta, 3803 Dunlavy at West Alabama, Lancaster Place, Montrose. The Susanne takes it down: Once Wilshire Village across the street completed its transformation from old apartment complex to the sparkling new H-E-B Montrose Market, it was time for this 1962 grocery store to turn into — a new apartment complex. But it took some time. Survey stakes showed up around the market and the shops in the attached strip center back in November 2011. But the store didn’t shut down until the following July, and it wasn’t until a year later that the demo was completed. Developer Marvy Finger is planning an 8-story “Mediterranean style” structure, called The Susanne, for the site. 6. Cafe Adobe, 2111 Westheimer Rd., Upper Kirby. The hot-spot Tex-Mex restaurant stood at the corner of South Shepherd Dr. and Westheimer since 1981 — until it didn’t anymore. Hines bought the property last year, with plans to construct a 215-unit apartment complex on the site, which sits just behind Kirby Dr. The restaurant remained open until Mother’s Day; it was torn down in August. 7. Foley’s, 1110 Main St., Downtown. Early on the morning on September 22, Downtown lost its only department store. The 10-story 791,000-sq.-ft. building that took up the whole block bounded by Main, Travis, Dallas, and Lamar was detonated in a giant cloud of glorious dust. The 66-year-old brick almost window-free box had been designed for Foley’s by the now-oft-demoed Kenneth Franzheim as a model of modern retail efficiency; it became a Macy’s in 2006. Hilcorp plans to build a 23-story headquarters building for itself in its place. Which one of these ghosts of Houston past deserve to be remembered forever as the Best Demolition in 2013? You tell us! Easily Foley’s. It was a Houston icon. The demolition was also one of the coolest things I’ve ever been witness to. Although Fiesta is a close second, mostly due to the SWC going from apartments to grocery store, and the SEC going from grocery store to apartments. How very Houston. Also the evolution of Montrose can be summed up with that shift from a loveable but average Fiesta to a fancier HEB across the street. 7. Foley’s or Macy’s. The demolition encompassed an entire city block! #7: Foley’s, with a very fond goodbye. Foley’s. No contests. I always liked to think about a time in Houston when people would head into downtown to shop and see a show back when the Galleria surrounded by farmland. At the same time, it is exciting to see what will come of all the renewed development in downtown. #1 – So i forgot to mention this gem…. What about those Townhomes that fell down in the storm over the summer near Walmart? Does that count as a demolition? Also, i’m nominating the Sky Bar for next year. Foley”s. I worked in their 9th floor advertising department when fashion illustrations were line-and-wash drawings instead of photos and ads ran daily in Houston’s newspapers. Foleys. Sears in Midtown… 2014 is your year to contribute to the rubble pile. Foley’s. But, I kinda feel bad for the other nominees. Foley’s (7) far & away! 2 is the runner up and 5 (don’t forget, it was three other supermarkets prior) a close third. Wow, tough ballot. So many places that I have memories of. Crazy to think Cafe Adobe is gone; it is not a huge loss but i had some fun times there. The Randalls was very iconic in my mind. The first time i saw it, i was like wow, what a fancy grocery store. I think my vote goes to Randalls. I’ll go with the popular choice of Foley’s. But the category name is kind of misleading. “Best” demolition makes me think which of these is it best to get rid of, since it was a blight upon the community. I’m not really happy to see downtown lose the Foley’s building. However, it was the most iconic demo of the year here. Maybe next year we can change the title of the award category. 6. Cafe Adobe. This is actually a perfect example of the boom in huge apartment buildings inside the loop, and the increasingly rapid displacement of “old” and/or “funky” Houston establishments. Maybe Cafe Adobe wasn’t the best example of these older establishments, but it certainly wasn’t a good fit with the clean-cut ultra-hip image that a new apartment complex will be seeking to project. The number of huge new modern apartment complexes going up inside the loop today is completely mind-boggling. Maybe it’s good, maybe it’s bad, and maybe it’s neither. But that’s what this demo represents to me. Too many to choose from! So many memories at Cafe Adobe, and I loved my little Fiesta. The Astrodome should have been either converted or demoed so long ago…Guess I’ll have to go with Foley’s. It was a neat store with loads of history. It’s not the first nor last Randall’s to close. But, the most iconic store. It was the flagship store of the hometown favorite grocery store. It felt that Randalls was locally owned. Randalls, years or perhaps decades before, was THE grocery store for Houston. And not just this location, but they were proud to boast a dozen plus store. Randalls has been a survivor of the tough, crowded grocery market. Randalls and Krogers have survived over the years. Randalls has thrived despite a number of stores coming and going. Among the defunct, Safeway, Appletree, Gerlands and Rice Epicurean. HEB has invaded Houston with a variety of stores in the past twenty years. Wal-Mart now sells groceries. Whole Foods is now here. Trader Joes and ALDI have recently arrived. While these “foreign” stores have expanded into Houston, Randalls has been slowly retreated. This demolished Randalls had it’s own architectural style. It featured stonework and gabled roofs. It was a stylish retail store years before it became a trend in Houston. It was the flagship store of a once Houston proud grocery store. Foley’s–it’s sad that Houston has no downtown dept. store, although Macy’s doesn’t seem to be able to pull off big downtown stores (i.e. Marshall Field’s on State in Chicago). #2. Foley’s was a tragedy but in order to stay positive I say yay to the destruction of anything from the sulfurous intersection of football/corporations/oil interests. From perusing the final sale to seeing the aftermath of the demo, Foley’s! Unfortunately many tough choices. I am a former Astrodome employee, a shopper at Fiesta on Dunlavy, a customer at cafe adobe but by far for this year the winner is the demolition of Foley’s. #2. The demo of the ramps etc. My prediction is that in 2014 various proposals to repurpose the dome will be deemed too expensive or impractical to implement since the dome is not ramp accessible and lacks the requisite electrical equipment, making full demolition the only viable choice. Fiesta — I still miss that store. The number of times I’ve visited the HEB food store could be counted on one hand, and seems to indicate that HEB hasn’t quite filled the void left by the Fiesta store. I end up shopping more at Trader Joe or Randalls or another Fiesta (often far away) instead. Astrodome. Seriously, why is this such a big deal and yes I’m from Houston. Shovels?…. we dont need no stinking shovels! #7 Foley’s. Having grown up in Houston, I will always remember what a Saturday treat it was to take the bus to Foley’s. And those fun Christmas windows were special. #7. I miss downtown shopping but such a windowless prison for the employees . The Swamplot Awards for Houston Real Estate, 2013: The Winners!